The route to Place Fell is straightforward. The path to Boredale Hause (not visible here) lies down to the right: it's not always clear and there's no great advantage in following it. From the Hause the path up Place Fell is a well-worn tourist route. 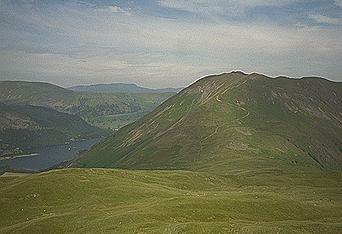 On the left of the picture Watermillock Common lies beyond Glenridding Dodd and Glencoyne wood. Blencathra is on the horizon.